Diesel Haus is a full-service Sales, Service, Parts and Repair shop for Diesel trucks and heavy equipment based in Rochester, NY. Diesel Haus is proud to have Master Service technicians on-site that are certified in Air-Brakes and much more. We rebuild diesel engines (CAT, Cummins, International, Mack etc.,) and (Eaton, Fuller, etc) transmissions (manual) in-house. All rebuilt motors come with a 1 year warranty. If you drive a truck for a living, even the slightest malfunction can result in a loss of productivity and money. And if you're like most truck drivers, you can't afford to sit around and wait for days on end while your vehicle is being serviced. Fortunately, we're here to help. At Diesel Haus, we offer quality and efficient truck repair services designed to keep your vehicle running safely and smoothly. There's no question that a truck is a significant investment. 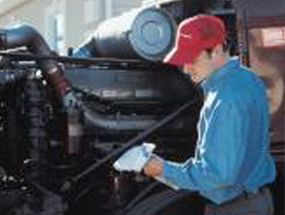 So if you need reliable truck repair services, ours is the team to trust. At Diesel Haus, we're dedicated to serving our customers' needs, and we go out of our way to provide the quality repairs your vehicle deserves. If your truck isn't operating as it should, don't panic. Call us today for more information about our truck repair services or to schedule an appointment for your vehicle. To learn more about our services and specials, contact us or stop by today.